Here you will find our range of standalone 52mm auto gauges, this can be a popular size of gauges for people wanting to use many gauges and the larger sizes there just isn’t enough room, or for people that already have 52mm gauge pods in their cars already. We will be stocking all the popular 52mm gauges, such as boost, oil temp, water temp, oil pressure, egt and more. Again with our gauges, first and foremost is function, the gauges come with quality sensors and not cheap nasty stuff. 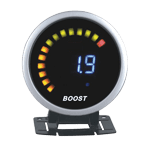 The gauges all have fast refresh rates which is most important on gauges like boost, air fuel ratio etc. Then next up is of course form, we all want our gauges to look cool. But our first priority will always been quality, there is no point having a cool looking gauge that doesn’t function as well as it looks. And of course we want to achieve the above while keeping the costs reasonable, so function, form and cost that won’t break the bank, that’s what you can expect with our range of 52mm auto gauges. Here we have our decent looking LED 52mm air fuel ratio gauge. These will be of interest to people w..